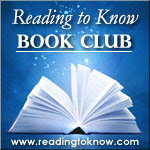 1984 was April's book of choice for the Reading to Know Classics Book Club. Annette selected this title for us and she will be sharing her opinion of it and leading off the discussion tomorrow. (Stay tuned for that.) This post here is documenting my thoughts to add to said discussion. "The year is 1984; the scene is London, largest population center of Airstrip One. Airstrip One is part of the vast political entity Oceania, which is eternally at war with one of two other vast entities, Eurasia and Eastasia. At any moment, depending upon current alignments, all existing records show either that Oceania has always been at war with Eurasia and allied with Eastasia, or that it has always been at war with Eastasia and allied with Eurasia. Winston Smith knows this, because his work at the Ministry of Truth involves the constant "correction" of such records. "'Who controls the past,' ran the Party slogan, 'controls the future: who controls the present controls the past.'" In a grim city and a terrifying country, where Big Brother is always Watching You and the Thought Police can practically read your mind, Winston is a man in grave danger for the simple reason that his memory still functions. He knows the Party's official image of the world is a fluid fiction. He knows the Party controls the people by feeding them lies and narrowing their imaginations through a process of bewilderment and brutalization that alienates each individual from his fellows and deprives him of every liberating human pursuit from reasoned inquiry to sexual passion. Drawn into a forbidden love affair, Winston finds the courage to join a secret revolutionary organization called The Brotherhood, dedicated to the destruction of the Party. Together with his beloved Julia, he hazards his life in a deadly match against the powers that be." 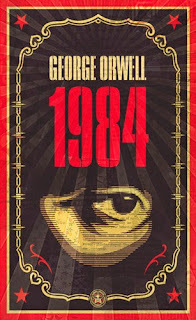 1984 opens with an introduction to the character of Winston Smith who is avoiding the telescreen which occupied a prominent place in his living room. The telescreen offers Big Brother a portal into the homes of all citizens of Oceania. Big Brother uses the telescreen to watch its citizens and read their very thoughts. Winston is tucked away into an alcove where he cannot be seen by the screen and there he opens up a diary which he purchased some time ago but had not yet dared to use. In it he writes the words, "I hate Big Brother." The story is relayed entirely through the thought process of Winston. Here is a man who has spent his entire teenage and adult life living for and working for the governing party who is Big Brother. He is not encouraged to think his own thoughts and/or have any emotions whatsoever. Constant and total obedience to the party is a requirement for life itself. Big Brother desires that you do not have a memory for anything that might have happened in the past, nor any strong emotions (such as love or hate) which might direct your thoughts and actions in the present. Everything and everyone is controlled by Big Brother and to deviate from Big Brother's direction is to die. Winston knows that he is a walking dead man because he hates the party, does remember events in the past, and also because he falls in love with a younger woman. Winston's love interest in the book is named Julia. Although Winston is married to another woman, his wife never enters the picture. He was matched and married to his wife by the party, who do not desire that a couple should be so much as physically attracted to one another as that might create an emotional bond. Winston's wife left him some years before Julia appears on the scene. Julia and Winston develop a relationship after she confesses to him that she loves him. This awakes his desire to think for himself and to live apart from Big Brother. The entire middle section of the book discusses their adulterous relationship (divorce not being legal, Winston is still married) and their growing love for one another. I would guess that Orwell's purpose here is to show that emotions are a basic aspect of humanity. Emotions make us human. Love creates bond; hate creates space. Either/or produces unique thought processes which direct humanity's desire to see changes made in their present circumstances. Emotions make us want to shake things up and move things around more to our liking at any given moment. Yet the people of Oceania were not allowed to question, speak or call for change. It was desired that they remain as "white" and "pure" as possible to follow the directives of Big Brother. To feel caused deviation. 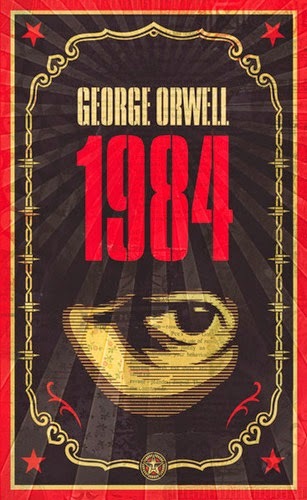 The third section of 1984 discusses how the party controls the citizens and makes them never to question Big Brother. Winston and Julie's love affair is discovered and they are taken to the "Ministry of Love" to be corrected. The desire of the party is to cause them to think like a party member once again. After this has been accomplished - through torture - and the citizen redirects their devotion towards Big Brother, they are killed. As you might imagine, this is not a happy, pretty book. We meet misery, find love and see how that effects behavior, and then are crushed at the end. We also come to understand why not thinking for yourself causes utter reliance on Big Brother. Of course, 1984 was written as a warning to the good citizens of earth, to be wary the dangers of a totalitarian government. This is very much a political work and a thoughtful one. (Here is a letter which George Orwell wrote explaining why he wrote 1984.) Certainly I think his warnings ought to be taken. I don't hide the fact that I'm a conservative and am wary of government being given (or taking) control away from its citizens. To think for one's self is a right which most definitely ought to be preserved and fought for as necessary. Two plus two does equal four and we need to hold to that truth and not allow for those in leadership to convince us otherwise. I am frequently bewildered by the lack of memory possessed by many Americans these days. We want a Republican president because we decided we didn't like the Democrat leader this last year. They forget how much they hated the Republican president before and the fact that all humans have weaknesses and failures. We pretend that all humans are strong and then are shocked when we see a crack in the armor. We can't remember facts and dates, what caused wars and/or what ended them. So many Americans act completely clueless about the past that if I think about it for too long I honestly become frightened. History is re-written every time a politician gives a speech and we either pretend not to notice or "let it slide." Either way its dangerous to not dwell on fact (i.e., truth) and keep our memories in proper working order. I think this is an important point to make not only politically but personally as well. Remembering the facts involved in our day-to-day interactions with other people is equally important to insuring a good relationship, built on trust and mutual respect. George Orwell argues well for the preservation of an accurate memory and any human ought to take note of that. Telling ourselves the truth and holding onto it tightly is sometimes a difficult thing to do, to be sure. Yet, as Orwell points out in this epic work, it is absolutely imperative. Taking the time - no matter how long or how hard - to work out the truth of any given matter and then to live it is worth everything. It is worth freedom that comes in many varieties. Clutch truth and hold on tight. Even if it's hard work, it's worthy work. I'm really glad to have read 1984 despite the fact that it was rather unpleasant. Learning to value truth is something that does not come easily; it is surprisingly hard sometimes. Yet it is unquestionably important! Thanks, Annette, for choosing this book for us this month. And thank you Heather for talking about it so much that I was eager to get to it! I read this back in high school and had no desire to revisit it, but I agree it's an important book to read at least once in one's lifetime. I hadn't thought it while reading 1984 - but reading your review here makes me think Orwell makes a pretty effective case for studying original source documents in the study of history, doesn't he?